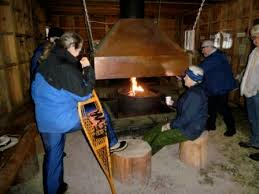 The Warming Hut is a great place to warm up by a roaring fire on a cold day, and enjoy a complimentary hot beverage (tea, coffee, cider, or cocoa) served by friendly Docents. Donations are always welcome. The Warming Hut is normally open Saturdays & Sundays, with some additional days around holidays.